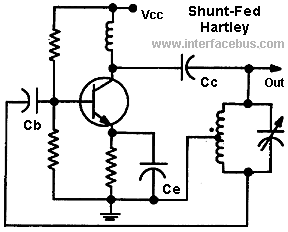 A Hartley Oscillator is a style of oscillator that uses two series connected inductors or an inductor with a center tapped coil, along with a capacitor. The tank circuit is formed by the inductor and the parallel capacitor. An oscillator circuit requires an amplifier which has a feedback path between the output and input. The feedback point for the Hartley oscillator is between the two inductors, or the tap on the inductor, as shown in the diagram. The amplifier used in each of these circuit examples is a transistor; although any amplifier could be used. Because the definition of a Hartley oscillator only defines the method of the feedback tap any transistor configuration may be use. The graphic below shows three different Hartley oscillators, each using a different transistor configuration: Common Base [CB], Common Emitter [CE], and Common Collector [CC]. The tuned circuit, or tank circuit is identical in each different layout. Either type of transistor may be used; note that the configuration graphic uses PNP transistors as examples, but the circuits use NPN transistors. The tuned circuit of an oscillator may be connected to the amplifier circuit in one of two ways. 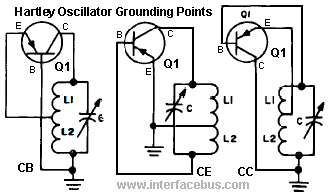 A series-fed oscillator uses a tank circuit which is in series with the same supply voltage used to drive the amplifier. A shut-fed oscillator will have the tuned circuit in parallel with the amplifiers supply voltage. So that the amplifier draws its current directly from the supply, although there might be a bias component between the two. The frequency of oscillation is determined by the inductor(s) and capacitor values used in the tank circuit. The basic equation for the Frequency of Oscillation, which includes the total inductance of both inductors [Lt] is used: Fo = 1 / [2 x 3.1415 x (Lt x C)1/2]. The total inductance is calculated by the individual values of the inductors and their mutual inductance; so; Lt = L1 + L2 + M (the coupling factor). Another example of a Hartley oscillator is shown below. The circuit uses a transistor again, but that could easily be replaced by a FET. A PNP transistor could also be used if the polarity of the supply voltage was changed. The coupling capacitors are labeled in the circuit, but have nothing to do with the tuned circuit. The variable capacitor in the LC circuit is the one that forms part of the tuned circuit.